We are thrilled and honoured to share with you that The Right Honourable Justin Trudeau, Prime Minister of Canada, will deliver a keynote address to open the GLOBE 2016 Leadership Summit and Innovation Expo in Vancouver on March 2, 2016. "The future belongs to countries and businesses that become leaders of clean technologies, innovation, and sustainability. 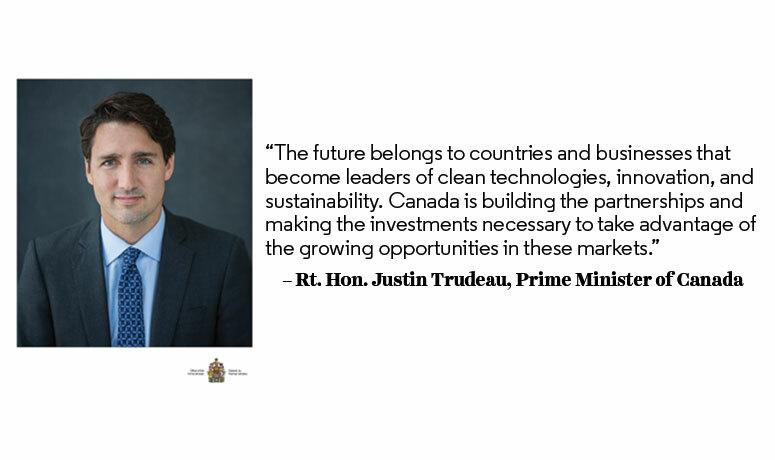 Canada is building the partnerships and making the investments necessary to take advantage of the growing opportunities in these markets," said Honourable Justin Trudeau, Prime Minister of Canada. As the first major North American business event to follow COP21, GLOBE 2016 will host hundreds of leaders from industry, government, and civil society to discuss how best to maximize the economic opportunities presented by the Paris Agreement. The Prime Minister's remarks will set the tone for these important conversations. We look forward to seeing you at GLOBE 2016. Michael Kobori, Vice-President, Sustainability, Levi Strauss & Co.
Trisa Thompson, Vice President, Corporate Responsibility & Talent and Capabilities, Dell Inc.
A limited number of delegate passes are still available.